Shopping for Star Trek Kitchenware? 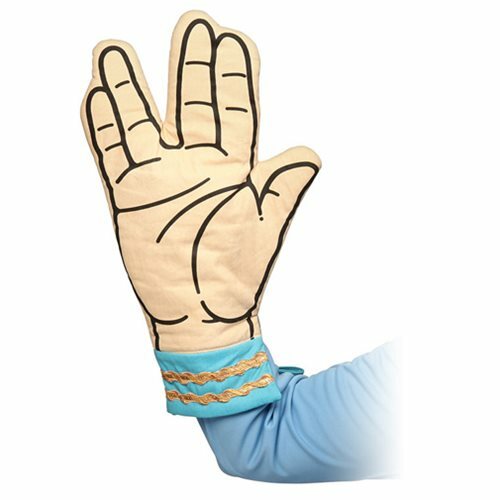 Spock lends a hand in the kitchen with this Spock Oven Mitt! Protect your hands from danger and greet your fellow crew members with a warm Vulcan sign of peace. No longer will you have to choose between burning your food and burning your hands! Cook well and prosper. Made of 100% cotton and lined and filled with 100% polyester, this Star Trek Spock Oven Mitt is the perfect addition to your kitchen! Measures about 16 1/2-inches long x 8 1/2-inches wide. Ages 13 and up.